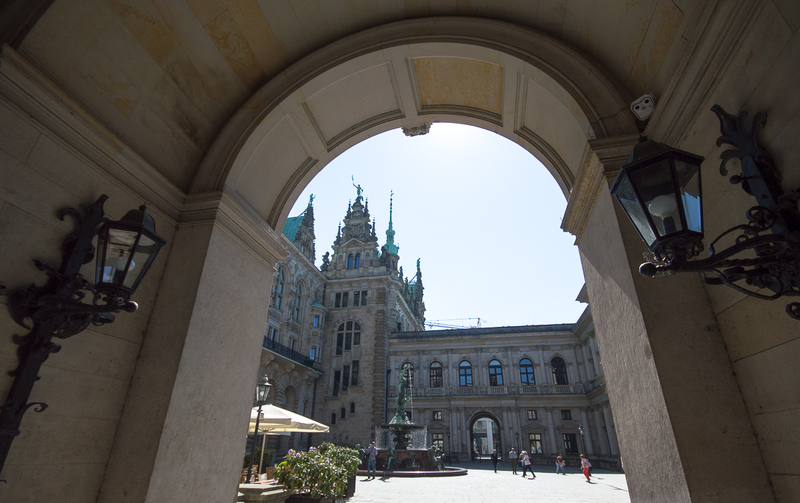 Hamburg offers a lot to see and is definitely always worth a visit. 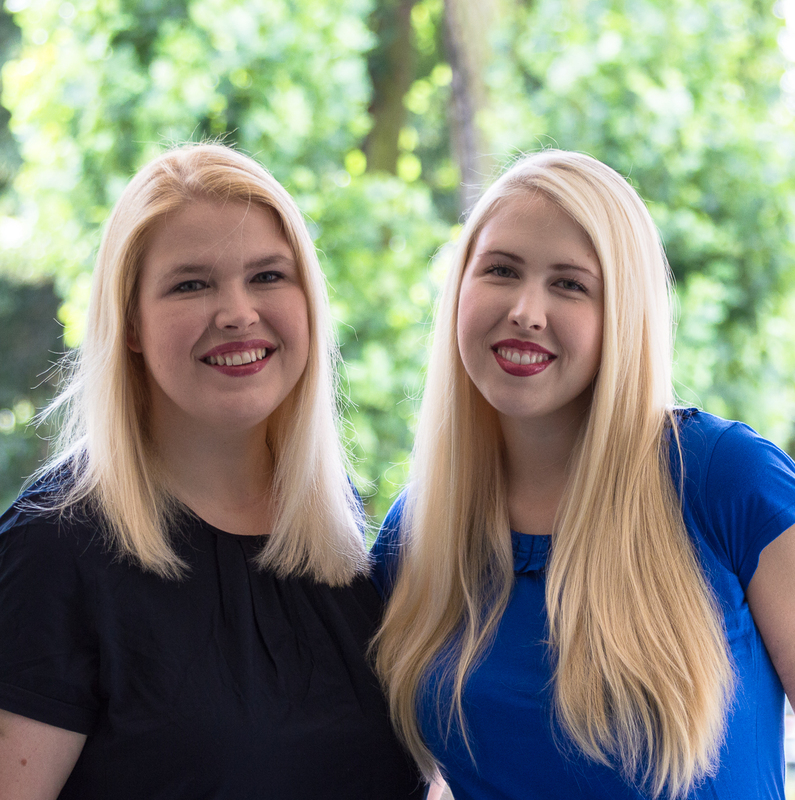 We love Hamburg not only because the sea and the water everywhere, but also because a visit to Hamburg is always fun and a wonderful experience. We will give you 10 insider tips, so that you can enjoy a great day or a wonderful weekend in Hamburg. 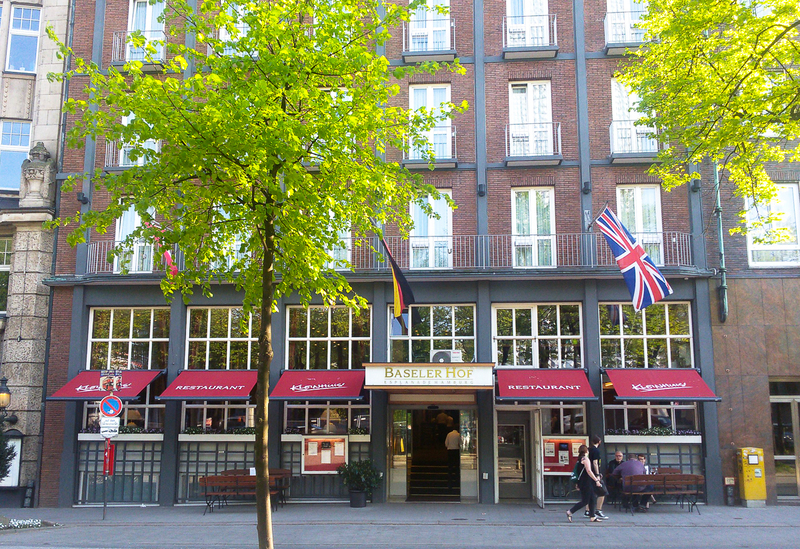 The Baseler Hof is one of the last family-owned hotels in Hamburg. It is a 4 star hotel, which has accommodated guests in Hamburg for more than 100 years and the staff takes care of you wholeheartedly. 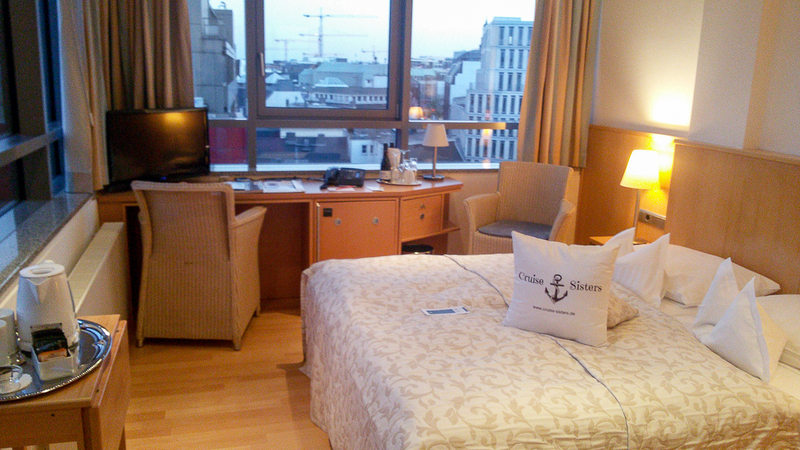 The hotel is centrally located at the Binnenalster and the Hamburg State Opera. The Stephansplatz underground station is just 150 meters away. 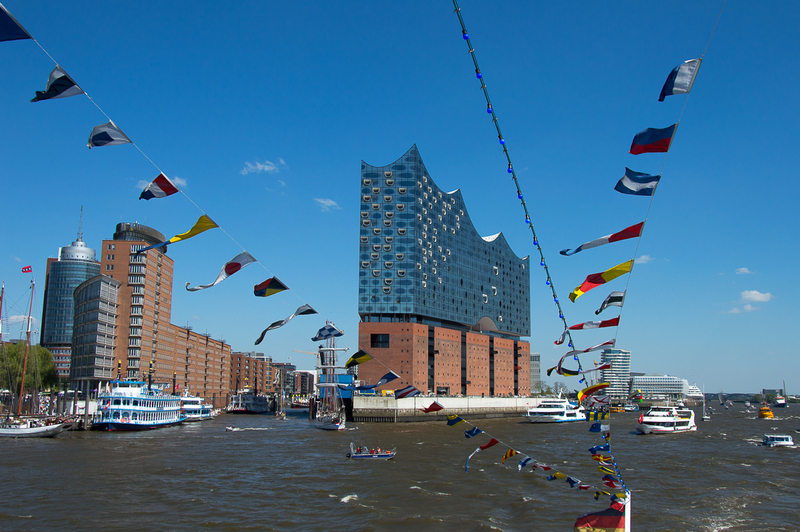 From the hotel you can reach the town hall by foot within 15 minutes and the famous Speicherstadt within 25 minutes. You can park on the middle strip directly in front of the hotel. The rooms are decorated in light colors. From the upper floor you have a great view over the rooftops of the city. The breakfast is really delicious. There are various teas, juices, sparkling wine, coffee, fresh bread and rolls, cakes, fruits, cereals, freshly prepared egg dishes and fish. The breakfast really lacks nothing. Our tip: For 5 euros you can get a breakfast to go in a lunch box. You simply have to contact the service staff. That way you can explore Hamburg with delicious food on your way. With the Hamburg Card you can travel free of charge with all buses, trains and harbor ferries in the large area (Rings AB) in Hamburg. Even the fast bus and night bus can be used without surcharge. The simple day ticket of the Hamburg transport association otherwise costs 3.20 euros per person for the large area (Rings AB) in Hamburg. The Hamburg CARD single ticket costs 9.90 euros for 1 person and 3 children (between 6 and 14 years). But the Hamburg CARD offers you not only free travel, but also discounts for many tours, guided tours, museums, theaters, restaurants and musicals. So if you want to do a lot of things, you should definitely get this card. 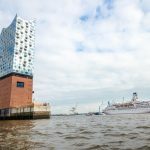 For example, you will receive a 2.50 Euro discount on the city tour of the red double-decker and a 3.10 Euro discount on a traditional harbor cruise from the Barkassen-Centrale Ehlers. If you also want to eat at the Hard Rock Café (there you get 20% discount), then it was already worth it paying the price. 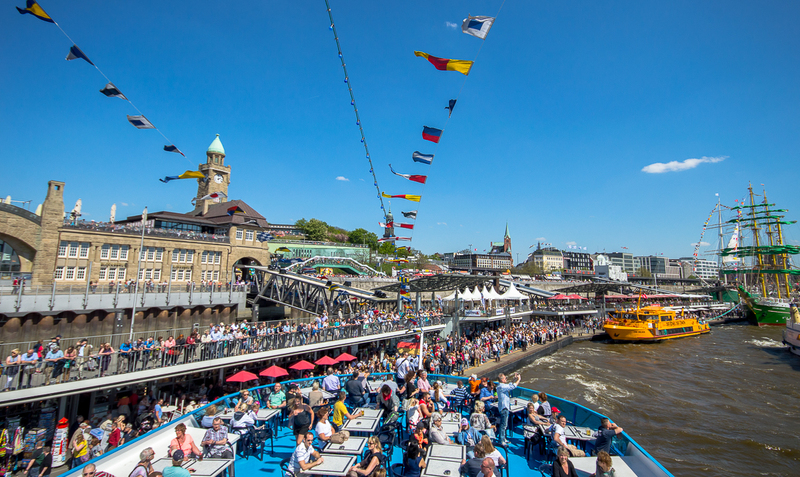 By the way, you can read more about the Hard Rock Café and the great view over the harbor of Hamburg in our blog post “3 Tips for the Hamburg Cruise Days Parade”. Our tip: If you are a couple or you visit Hamburg with several people, the Hamburg CARD Group Card can be used for up to 5 persons of any age for only 17.90 Euros. 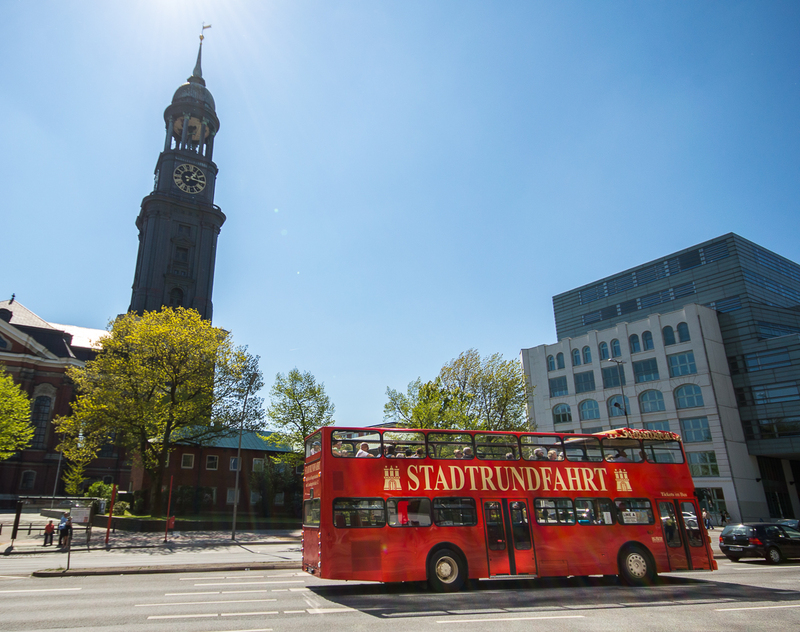 The city tour with the red double-deckers line A takes you to the most beautiful squares in Hamburg. It is the absolute classic way to discover Hamburg. 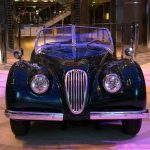 You will drive along the HafenCity, the Speicherstadt, various museums, the town hall, the Alster, villas of the rich and beautiful in Harvestehude and the Reeperbahn. During the tour a very charming tour guide will tell you some exciting and amusing details about the city areas. This tour is not at all boring and so some laughs are guaranteed. It was definitely the best and funniest city tour we have ever been on. There are 28 stops and a tour takes 90 minutes. In the summer months of April to October, the red double-deckers depart every 20 or 30 minutes. So you do not have to wait for a long time. The day ticket costs 17.50 euros and with the Hamburg Card you get 2.50 euros discount. Our tip: Go on a first tour with the red double-decker to laugh and listen. On the second tour you can stop and get out at the most beautiful spots to explore the city. 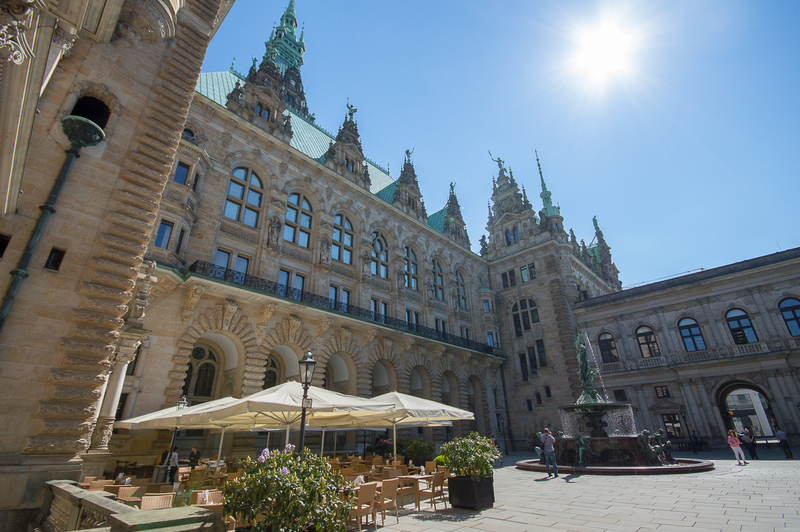 The town hall in Hamburg is located in the middle of shopping streets, nice cafes and next to the small Alster. It dates back to the late 19th century and was built in neo-Renaissance style. But why so late? 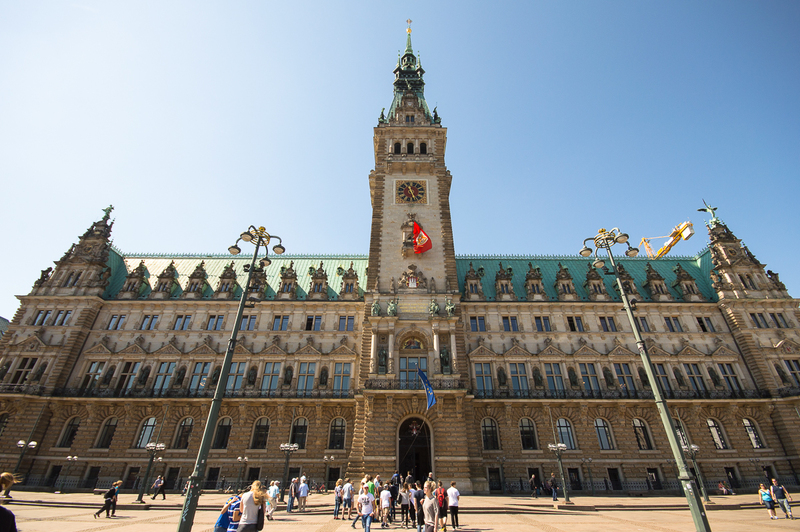 In 1842, a fire threatened to spread out in Hamburg and the town hall was used as a shelter for the inhabitants. The fire could be stopped and a new town hall had to be built. But 55 years passed until the new town hall was officially inaugurated on 26.10.1987 with a great folk festival. If you are already in front of the town hall, you should also take a look inside the courtyard. There is the Hygieia fountain with a large figure, which shall remind you of the last great cholera epidemic in 1892. If you want, you can stay there and have a coffee. 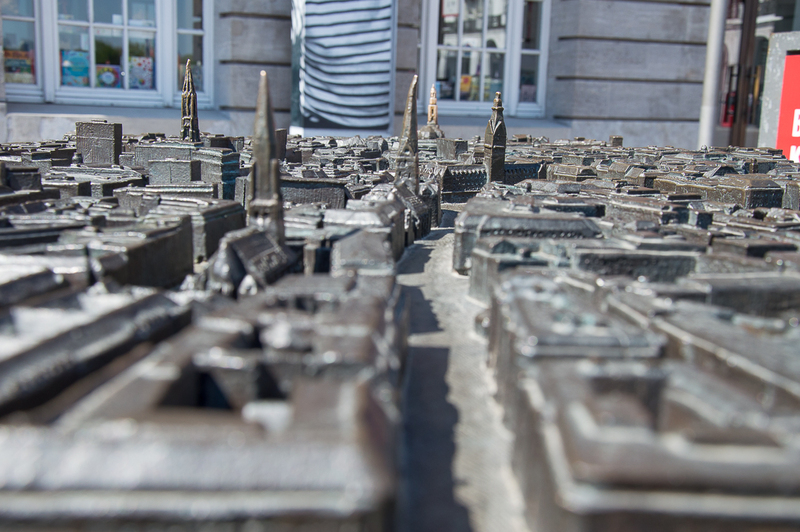 To the right of the entrance of the town hall, in the direction of the small Alster, you will find a bronze model that shows the buildings and streets of Hamburg city center. 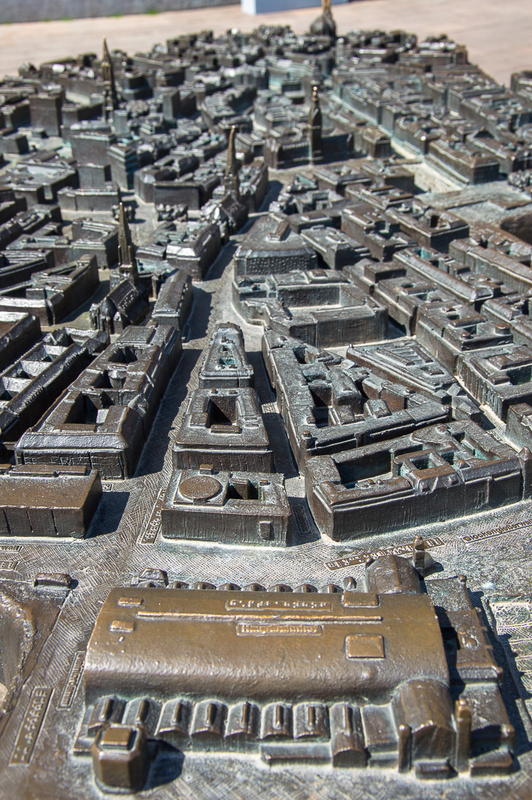 This three-dimensional model was built by the Lions club Hamburg for blind people and serves to get a better idea of Hamburg. But not only for the blind it is a wonderful experience, because you can touch the model, feel the city and look at it from above. 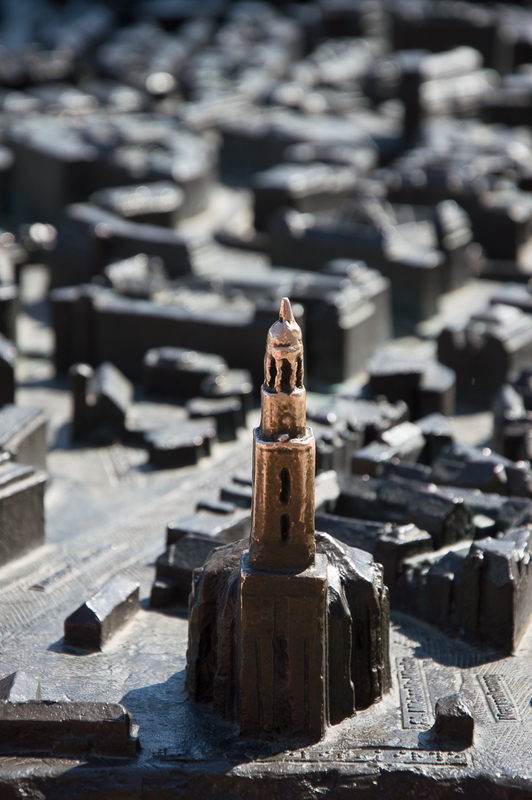 Our tip: Explore the inner courtyard of the town hall and touch the blind city model at the market square in front of the town hall and marvel at the city from a different perspective. AND: Rub the Michel church for good luck! Already since 1887 the tea house Theodor Maas exists and now exports tea and accessories in over 20 countries in the world. We love the traditional recipes and the creative tea specialties that you can find in this shop. The shop in Hamburg is located on the Börsenbrücke, not far from the town hall. 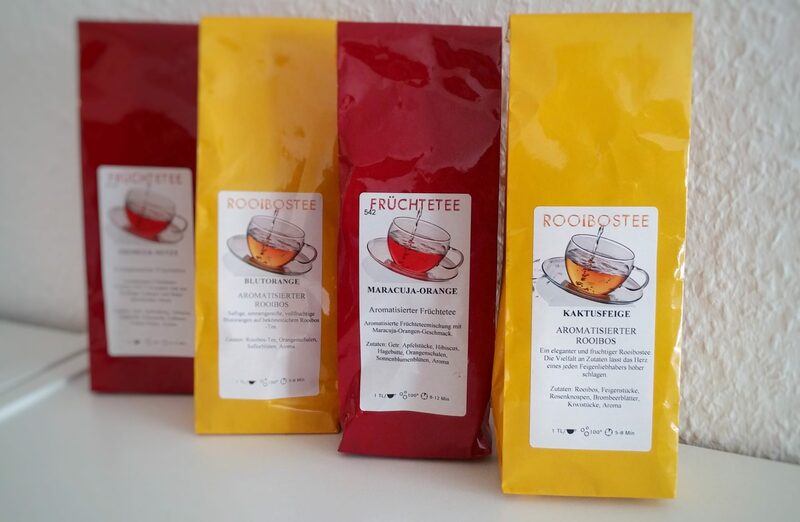 100 grams of rooibos or fruit tea cost between 3.50 and 4 euros. Right now in the summer we love to boil the teas and then enjoy them ice-cold as an iced tea. Varieties like Maracuja orange, strawberry mint or cactus cream are incredibly tasty and make the summer even better. Our tip: Have a look at the teas at Tee-Maas and find your favorite varieties for summer! You can sniff at all varieties and we guarantee you: The tea tastes just as delicious as it smells. 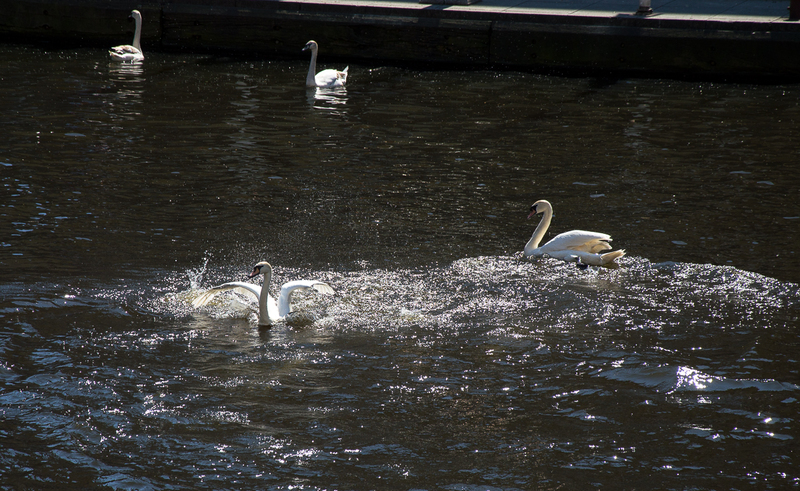 Our tip: Walk from the town hall over the lock bridge along the Alsterarkaden to the Binnenalster and you will discover some swans. 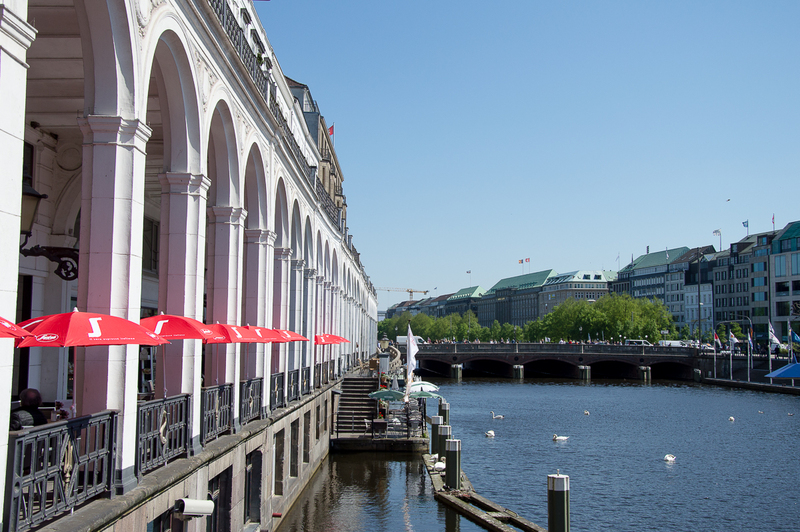 Directly at the Binnenalster in Hamburg is the café and restaurant MIO. Next to the large glass box there are many tables and chairs on the steps to the Binnenalster, from which one can enjoy a great view of the water. Here you can relax and linger while watching swans and ships. 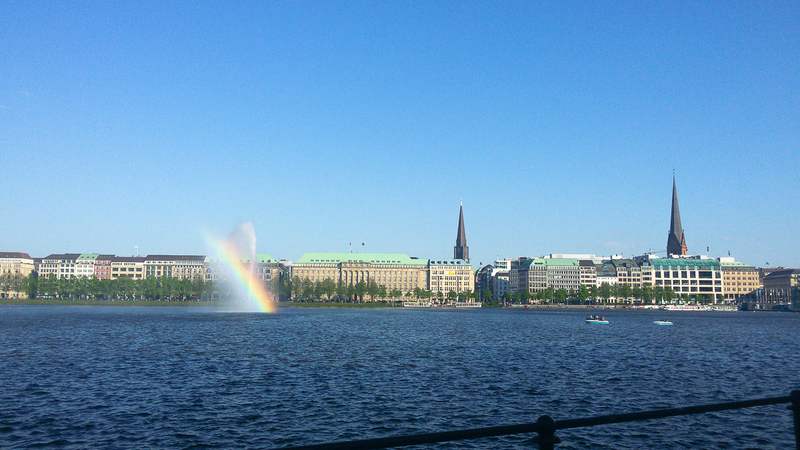 Sometimes you can also see a beautiful rainbow stretching out over the fountain, in the middle of the Binnenalster. Our tip: Enjoy a delicious coffee specialty in the MIO and a piece of cake or an ice-cream to recharge your batteries and to review what has happened so far during your Hamburg trip. There is not much to explain. If you are looking for free Wi-Fi, then you should go to the Apple Store at Jungfernstieg 12. You can use it as long as you want. You can also simply go and sit down, no one will send you away. Our tip: Just go to the Apple Store, sit down and surf! 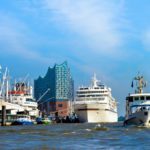 If you want to see the harbor of Hamburg from the water, you should definitely go on a 1-hour harbor tour by Rainer Abicht. You can choose between a traditional launch, a passenger ship and a paddle wheeler. The 1-hour harbor cruise costs 20 euros. You can also book a combined ticket at the red double-decker and purchase both tickets (city tour and port round trip) for a total of 30 euros. 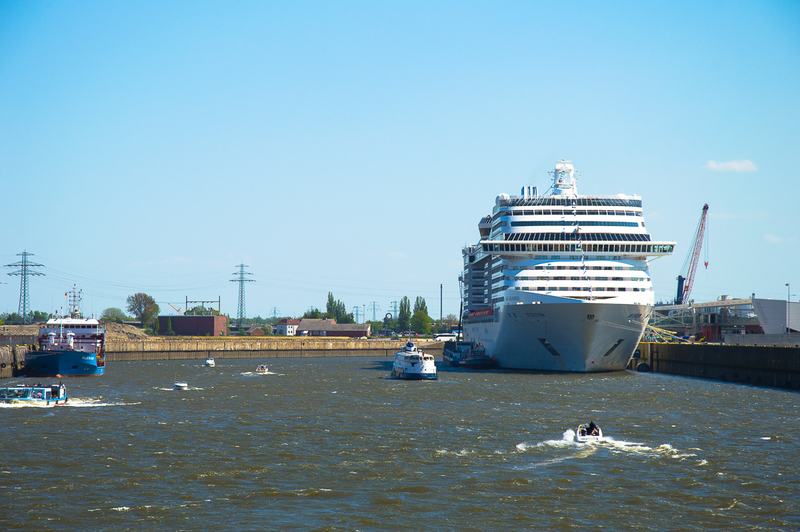 We tried a tour aboard the MS Hamburg, a luxury passenger ship. From the top you have an incredible view of the harbor. However, it is mostly windy up here. So put your jacket on and go up. 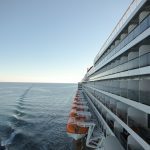 On weekends you will often see cruise ships in the harbor! 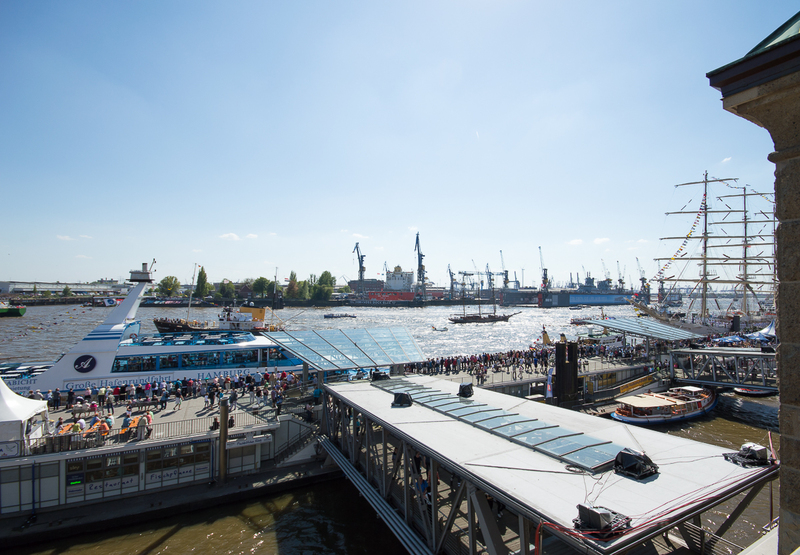 Our tip: Go on a 1-hour harbor trip aboard the MS Hamburg to discover the Elbe and the port of Hamburg. The Clouds is Hamburg’s highest restaurant with bar. 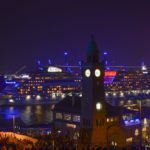 It is located on the 23rd floor of the Dancing Towers on the Reeperbahn and offers an incredible harbor panorama by day and night. There is a restaurant, a bar and a rooftop terrace. On the left in the corner of the bar area you have great seats with a view over the Michel and the harbor. Although the bar has high prices, the view is unique. You can order a cocktail for 12.50 euros, a glass of wine for 8.50 euros and a beer for 4.50 euros. There are of course also soft drinks and juices between 3,90 and 4,50 euros. You can find the bar menu online. Attention: You should wear a slightly chic outfit in the evening, the dresscode is casual elegant. You can not reserve a table for the bar. 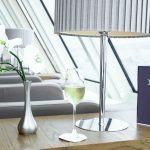 Our tip: Enjoy a cocktail or a glass of wine in the Clouds Bar or the rooftop terrace Heaven’s Nest with a panoramic view over the harbor. We would like to thank Hamburg Tourismus GmbH for the press trip in Hamburg. 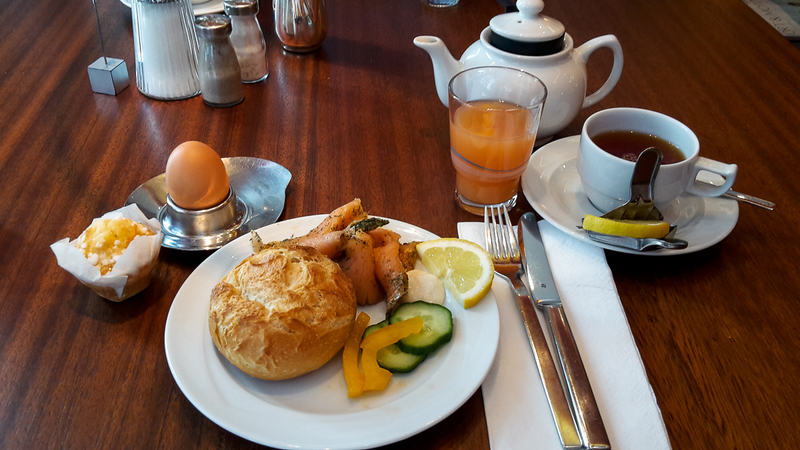 And we would like to thank the hotel Baseler Hof for an overnight stay with breakfast. This post is not sponsored, we only report about our own impressions. 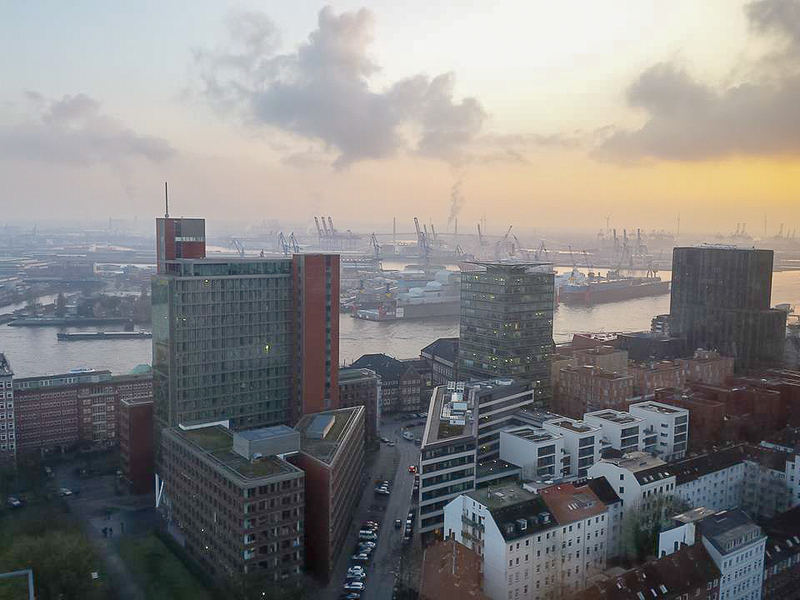 Do you also have an insider tip for Hamburg?